So the kit has arrived. 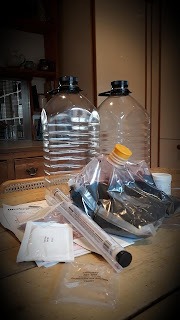 Not the gear I was originally toying with, but - following a discussion with PK - a starter pack from Lovebrewing, containing a Beaverdale Cabernet Shiraz ingredients box as well as a couple of demijohns, a siphon, a thermometer, hydrometer, all sorts. And he's acquired the same set, too, so that we can both attempt the same muck and compare our results.The tension is palpable. Slightly moreso when I get round to watching the DVD which comes included. 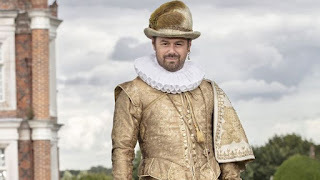 In this, an affable bloke called Richard stands at his kitchen sink and tells you how to make your own wine. Fair enough, except that his starter pack contains one enormous plastic bucket instead of two plastic demijohns; and he's bustling through the techniques required as if he's late for a train. I have difficulty keeping up. I sit there wondering whether to use the hideous old bucket in the laundry room to make wine in - and is there any way I can get it clean enough - as he flings materials and tapwater around on screen. Then I realise that his washing machine is in camera shot and that it contains some laundry. I become transfixed by this, trying to decide what's actually in the wash. Bedding, I reckon after a while, or towels. Finally I settle for bedding, at which point he's already tearing open sachets of yeast and additives as fast as his hands will let him and I realise that, just as in chemistry classes at school, I have strayed intellectually, could not tell anyone what I have witnessed and consequently have no faith that when I try the experiment it will come out anything like it's meant to. The good news is that Beverdale tell you what to do on a single sheet of pink paper packed with the plastic bladder of concentrated grape juice that is their stock-in-trade. This is more like it. I sterilise my gear, failing to use warm water, with the result that my hands are blocks of ice by the time everything's clean. I then admix grape juice and tap water in a demijohn, add some kind of ground-up oak powder for that fine oaky flavour at the end, chuck in the yeast, agitate, examine the resulting purple treacly foam with the hydrometer (bang on 1080, two successive readings). It smells a tiny bit rank, so I seal it up with an airlock and stand back. For some reason I am now mournful that it all should have taken so little time. Of course, it's not over. There's a lot of jaunty chat from DVD Richard about the right temperature at which to ferment your brew. It is alarmingly high: 23ºC is acceptable for much of the time. We are in the middle of the coldest snap of the winter and anyway, our house tops out at 21.5º during the day, before dropping off noticeably at night. Richard (who's wearing a T shirt, I mean it's clearly high summer at the time of filming) suggests various ways to keep your brew up to temperature, among them an electric thermal belt to wrap around the bucket/demijohn, a electric hot platform and an immersion heater. He also mentions cladding the thing in a blanket, which is what I go for - a blanket of bubblewrap, the stuff the demijohn was packed in, a nice symmetry, no extra cost and better for the planet, I factitiously assume. So there it is, in the shower at the top of the house where the air is warmest. If the demijohn explodes for any reason, the wreckage will be contained by the shower itself. There's also a heated towel rail nearby to keep things toasty. The demijohn is swathed from top to toe in bubblewrap. It looks oddly vulnerable on the floor of the shower. I leave the thermometer on top of the bubblewrap to let my wine know that I care. 21º it's saying, which I can live with. There are one or two lethargic bloops of gas coming up. The longer the fermentation takes, supposedly, the better the wine. At this rate, I will be bottling at some point in 2021. But you know what? PK hasn't even started. Time for a bottle of wine? During the recent festive break, some people with nothing better to do were circulating this statistical graphic. It purports to show the amount of time which various nations spend eating and drinking each day. Other people with nothing better to do, like me, were drawn to consider it. 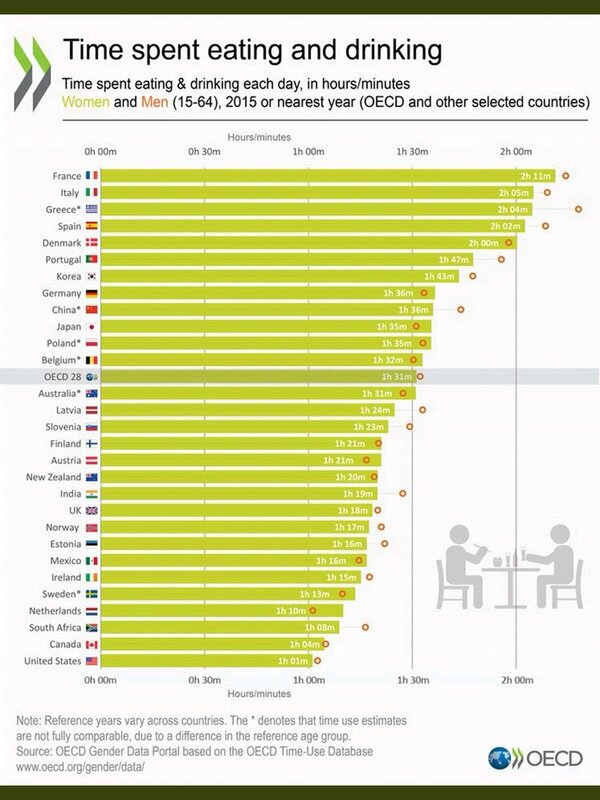 The French come top, sustaining every cliché there is, spending 2hrs 11mins a day eating and drinking. The average is 1hr 31mins. 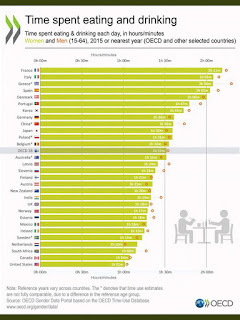 And we Brits come two-thirds of the way down the list, spending 1hr 18mins a day eating and drinking. But this cannot be drinking as you and I know it. Well, as I know it. In the corner of the graphic, two little stick people are sitting down at a table eating and drinking together with a bottle of something. They could be in a café, or they could be in their IKEA home, at their Guzla table. Either way, it’s a nice scene for anyone, let alone the stick people, who are generally only seen running for a fire exit. And there are indeed times when Mrs K and I sit together to eat and drink, just like the stick people. That is proper “eating and drinking”, whether at home or in a restaurant. But how much of our eating, let alone drinking, do any of us actually do like that? People have to eat at their desk, not because they haven’t got time to go to a café, but because the cafés are occupied by people on their laptops. So the cafés are full of people working, while the offices are full of people eating and drinking. Who’d be a statistician, eh? And then there’s drinking. Let’s suppose that while my meal is cooking, I open my bottle of accompanying wine in readiness. I taste it, of course, to make sure it’s okay. It’s jolly nice, thank you for asking. I may well sip a little more, just to while away the time while the pot I’m watching doesn’t boil. Is that drinking? Has my 1hr 18mins begun? After the meal, I carry my unfinished glass of wine into the lounge and switch on the TV. Is my clock still ticking? Am I still “drinking” while I am enhancing my knowledge with an accomplished historian. Presumably not. These statisticians must surely have ignored any drinking which takes place while also reading, listening to music, watching television, or musing upon the king my brother’s wreck. Because if they counted any of that as “drinking”, surely many of us will spend more than 1hr 18mins drinking wine beyond any meal itself? Perhaps what they’re describing is limited to that period when one is both eating and drinking? Whether that ropes in nibbling olives with a glass of white beforehand, or dunking cantuccini in Vin Santo afterwards, I cannot say or guess. But it seems a very narrow interpretation of “drinking” to me. And it would probably eliminate that clichéd Frenchman, who is sitting in a café for an hour with a glass of wine, but to a statistician is classed as “reading the newspaper” – or, in that definition beloved by travellers, “watching the world go by”. Still, it does mean that the next time I am accused of “spending the rest of the evening sitting there drinking”, I can now deny it. Because excuse me, as far as statistics are concerned, I have clearly not. 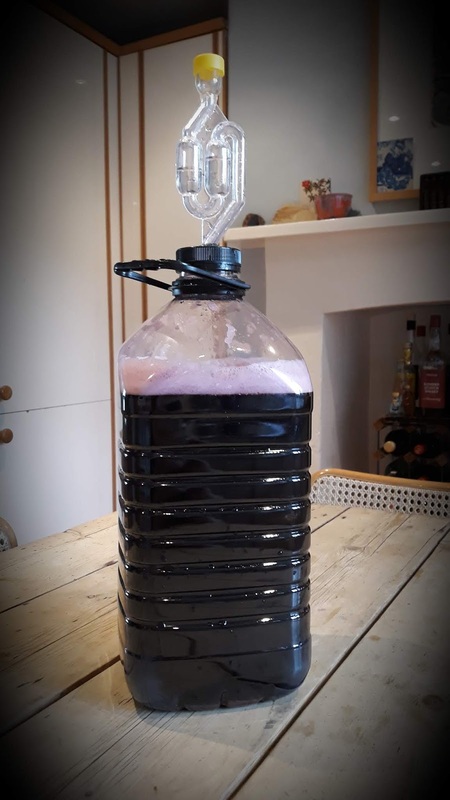 So the new year is upon us and it really is time to get this DIY wine thing going. I discuss it with PK. I say that we should each get a home wine making kit and attempt our own separate concoctions. He doesn't demur, so I go on, more confidently, Who should do what sort of wine? Should we each try a different brew, for the sake of variety? Or should we both do the same one, in order to make a proper comparison? Mm, he says, staring out of the window. Naturally I reckon I can make a better under-the-stairs beverage than PK and secretly play out scenes in my head in which we cautiously sip our makings and he nods, surprised, slightly aggrieved, and says, Well yours isn't bad, at which I preen and say, It's nothing special, you've either got it or you haven't, we can't all be gifted that way. Well why don't we both make the same wine and see whose is better? he says, at last. Right. I will start looking for wine kits. He then adds, Won't we need demijohns and tubes and other such things, in order to do it? Mm, I say. Good point. I have actually forgotten about this aspect of the process. All I have been thinking about is a box of powders and an instruction manual, having marginalised somewhere the actual physical plant needed. That's going to up the costs, I say, at least until we start making our wine in quantity, at which point we can amortise the layout on glassware, bungs and specialist tubing. He says, What? I go looking on the internet. I have no idea which retailer to go for. The Home Brew Shop looks alarmingly businesslike, with its five gallon wine kits and just about everything under the sun for making wine, beer, cider, liqueurs and spirits. It is dizzyingly polymorphous. Brew has a tidier punters' interface, but is every bit as overwhelming when you get down to the fine print. 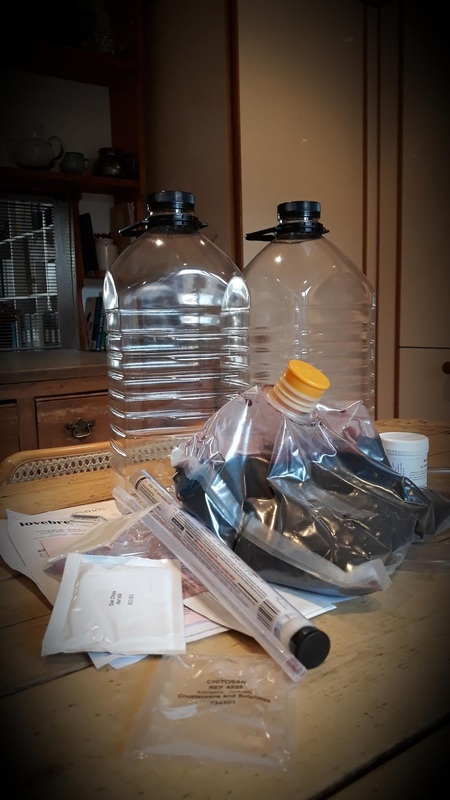 Lovebrewing I like the look of not least because it directs you straight to the Wine Equipment Starter Packs, with the basic pack (two one gallon demijohns, a hydrometer, thermometer, siphon and DVD) at a very reasonable £22.00. Art of Brewing clearly has everything I could want, but again, is daunting in its profusion of opportunities, like a provincial junk shop. The appealingly-named Beaverdale also looks tremendously purposeful, but again, perhaps too full-on for a half-arsed dilettante to feel really comfortable with. At any rate, I think I can see where to go for the basic infrastructure. Which still leaves me with the question of which wine to attempt to make. Why do I think that red would be a safer choice? For some reason I assume that a red, being inherently more flavoursome, ought to be more idiot-proof. It has more options. It is more robust. Also I still have memories of my Pa-in-Law's home-made white, made with the pungent little vines from his greenhouse plus all the dirt and tendrils and insects that he couldn't be bothered to separate from the grapes themselves. It was a tough beverage to get outside. Yet on TheHomeBrew Forum I find some discussion to the effect that, actually, it's harder to make a drinkable red than white. Maybe flavoursome is just another way of saying complex and complexity is my enemy. Therefore: back to Lovebrewing - pick up the necessary hardware and elect a beverage. What do you know? They'll sell me a Beaverdale pack straight off - and at £12.49 (special offer) for a six bottle Beaverdale Chardonnay kit, how can I fail? That or maybe a Belvino California White kit, which apparently makes thirty bottles for only £16.95 - except I don't have thirty used wine bottles to put all this bounty in, so back to Beaverdale, recklessly scorning the advice that litters the internet, to the effect that the more you pay for your wine kit, the better the resulting wine. Or Wilko, for God's sake, who first inspired in me (see pic) the desire to do this thing, down in the barren extremities of south-west Wales, where the rocks gleam in the rain and the sheep debate among themselves the correct form Brexit should take. 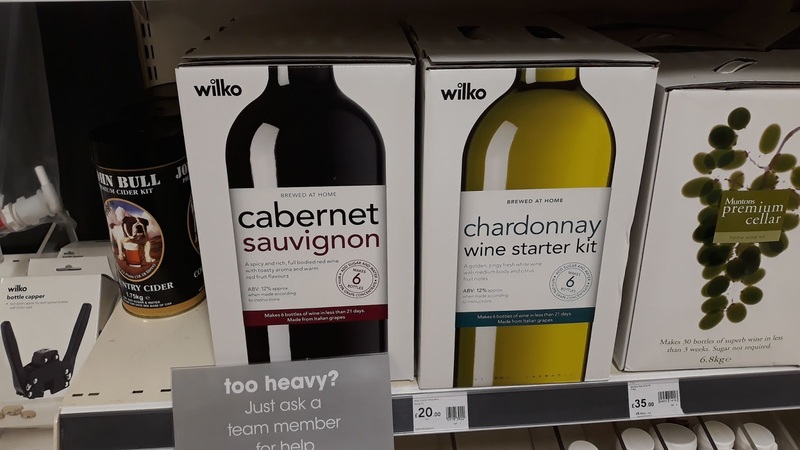 Wilko, of course, who seem to be offering a twelve bottle starter kit with everything you need plus a choice of wines - a Cabernet Sauvignon and a Chardonnay, all for £35.00. I take a deep breath. It's the Wilko box. I'm going to put it to PK. I'm excited, to be perfectly frank.